The superheater is another of the simpler devices in a steam car. It amounts to an eight to ten foot length of heavy-wall pipe that is mounted beneath the boiler and above the main burner fire. Its purpose is to add additional heat to the steam. However it performs one of the more important jobs in the operation of the steam car. The discussion that follows may be a bit technical but it explains the importance of the superheater. Being directly exposed to the burner flame similar to the 1/4" stainless steel pipe used to construct a burner vaporizer coil, a superheater coil is generally constructed of 1/2" seamless Schedule 80, 304 stainless steel pipe. The steam that is produced when water is boiled is called saturated steam. Saturated steam is nothing more than steam at the same temperature of the water from which it came. It does not take a lot of heat energy to raise the temperature of water from the freezing point (32° Fahrenheit) to the boiling point (212° Fahrenheit). To accomplish the 180° Fahrenheit temperature change of one pound of water requires about 180 British Thermal Units (BTUs) of heat energy. However to change the water from it's liquid state at 212° F to a gas or vapor (steam) state at 212° F requires an additional 970 BTUs of energy added (latent heat of vaporization) to the water. Simply stated, a total of 1150 BTUs of energy is required to change a pound of water at 32 ° F into saturated steam at 212° F. Thus at atmospheric pressure, like a pot of water on a stove, 84% of the heat consumed by the water in turning it into steam goes solely to convert the liquid water at 212° F into a gas at 212° F.
In the Stanley boiler the pressures are around 500 to 600 pounds per square inch (PSIG) depending on the setting of the steam automatic. For steam at 500 PSIG a total of 452 BTUs of heat energy is required to bring the water to boiling temperature with an additional 752 BTUs of energy to turn that water from a liquid into a vapor. That's a total of 1204 BTUs of energy to convert one pound of water into steam in a boiler that is maintaining 500 PSIG. Water under 500 PSIG of pressure boils at 470° F.
The problem arises in trying obtaining useful work from the steam regardless of the pressure of the steam. In order for the steam to be used it has to be conducted to the point where the work is to be performed (in the case of a Stanley Steam Car the work is done in the steam engine). The piping used to conduct the steam ends up being heated by the steam and thus absorbing some of the energy from the steam. As the steam gives up its energy it condenses back to water at the same temperature. If you follow the path the saturated steam takes to get from the boiler to the steam engine you will find a lot of opportunity for the steam to give up some of the heat energy it contains. As the generated steam leaves the top of the boiler (under pressure) it passes through a pipe to the throttle. Since this piping (called the dry pipe) is contained in the exhaust gas path for the burner, the dry pipe is heated and the steam actually doesn't tend to lose any energy. 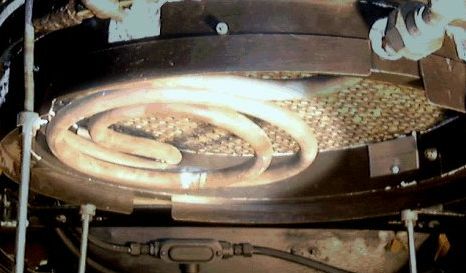 However in going through the throttle the restriction of the throttle not being fully open causes a pressure drop across the throttle and some condensation can occur. Once the steam leaves the throttle it must pass through the ten feet or so of piping to the engine where additional energy is lost by the steam and some small amount of the steam turns back into water. As the cylinders and pistons of the engine are massive (in terms of being heavy iron castings) there's yet another opportunity for the steam to give up its heat energy just heating the mass of metal. Thus, due to various heat losses from the piping and engine, a portion of the 752 BTUs of energy per pound of steam is removed from the steam as it travels to the steam engine at the rear of the car. If all 752 BTUs per pound are removed (a highly inefficient system) from the steam as it travels to the engine, all that remains is the water at the same temperature the steam started out as, by the time it gets to the engine's cylinders. Unfortunately water doesn't work with a steam engine. Thus a superheater is employed to add additional energy into the saturated steam, raise the steam's temperature, so that the steam becomes superheated steam. By doing this the steam can lose some of its heat energy as it is being conducted to the engine and still have a temperature above what it takes to start converting the steam back to water. Superheating steam is simply the process of heating steam above its saturation temperature or the temperature of the water from which it came. Steam can be superheated by simply passing it through the gasses of the fire used to change the water into steam initially. By superheating steam two things happen. First and most importantly is that with the steam at a higher temperature it can lose more of that temperature before it condenses back into water. Thus it becomes possible to carry the steam through a lengthy series of pipes after the superheater on its way to the steam engine. Even though some heat energy is lost, not enough heat is lost to change the steam back to water. Another important result of superheating is that the steam can undergo moderate pressure drops (such as occurs with the throttle when only partially opened) and not turn into water. You may remember that if you take a compressed gas and release it that the result is the released gas is colder than the temperature it had when it was compressed (this is known as the Joule Thompson Effect). This is the basic principal of the air conditioner where Freon gas under pressure is released through an orifice and in so doing gets cold. While the throttle contributes the most pressure drop in the Stanley steam system, the piping also contributes. For any long pipe carrying a liquid or gas there will be a pressure drop due to frictional losses. In the case of steam the pressure loss causes the steam to cool and thus be converted back into water. By superheating the steam, there can be sizeable pressure drops in the system and the steam will still have sufficient energy that it doesn't start turning back into water. Finally, superheating the steam imparts more energy to it and as a result makes the steam more efficient at producing work. Water at atmospheric pressure and 212° F occupies 0.01672 cubic feet per pound while saturated steam at 212° F occupies 26.8 cubic feet per pound. Changing a cubic foot of water into steam means an increase in volume of 1,602 cubic feet at atmospheric pressures. When done at 500 PSIG (which means the water will be at a temperature of 470° F) the volume of one pound of liquid water is 0.0198 cubic feet the saturated steam occupies 0.9006 cubic feet per pound of water from which it came. This is an expansion of 47 times for the steam at 500 PSIG. If one remembers some basic physics then for an ideal gas (which we'll assume steam is for discussion purposes) PV=nrt (the Ideal Gas Law) where P is pressure and V is volume. For a given temperature nrt is a constant and thus PV=PV. If we take 1 cubic foot of water and convert it to steam at 500 PSIG and calculate the equivalent volume at atmospheric pressure (14 PSIG) then the steam would occupy 1,598.6 cubic feet if the temperature were maintained at 467° F.
If saturated steam is passed through a superheater where it is raised 200°F in temperature that steam now occupies 1.2478 cubic feet per pound which is a significant increase over the 0.9278 cubic feet per pound it had as saturated steam. That same 500 PSIG steam now superheated with 200° F additional heat now expands 63.3 times (verses the 47 times for saturated steam at 500 PSIG). This means that the original 1 cubic foot of water, heated to steam at 500 PSIG and a temperature of 667° F would expand to a volume of 2,262 cubic feet at atmospheric pressure and a temperature of 670° F.
As a way to visualize this (in an experiment that assumes no friction, no energy losses, no gravity, and a few other impossibilities), if you had a 46.9-inch diameter mass-less/weightless piston sitting on top of an inch of water in a cylinder at 212° F you'd have a cubic foot of water contained under the piston. If you applied heat to the water and turned it all into steam at atmospheric pressure the piston would move 133.75 feet (assuming no friction on the piston and the steam stayed at 212° F throughout the cylinder as it expanded). If you performed the same experiment but held the piston in place, heated the water to 470° F and put the water under 500 PSIG, and then heated the water sufficiently to make it turn to steam then let the piston move it would travel 139.8 feet. The additional six feet of piston movement would be due to the added energy increasing the water/steam to 470° F. If you were able to hold the piston in place and heat the water until it turned to steam and then add another 200° F of heat to the steam (so that the steam was superheated to 670° F) you'd have the equivalent of the steam leaving a typical Stanley superheater. Now when you release the piston it would move 188.5 feet at which time the steam pressure would be atmospheric (this analogy assumes the system were maintained at 670° F). As you can see, superheating the steam by 200° F imparts about 35% more work that can be obtained from the steam. Typically due to thermal losses, pressure drops, and so forth only 20% or so more work is obtained in practice. So, in summary, by superheating steam three benefits are obtained. First is that the steam can cool due to thermal losses in piping and component and it won't start to turn back into water. It can also undergo pressure decreases within reason and not turn back to water. And as the calculations have indicated, superheated steam can produce more work than saturated steam. Jerry Lucas of the Marshall Steam Team contributed to this article by reviewing for accuracy and contributing to the technical information presented.